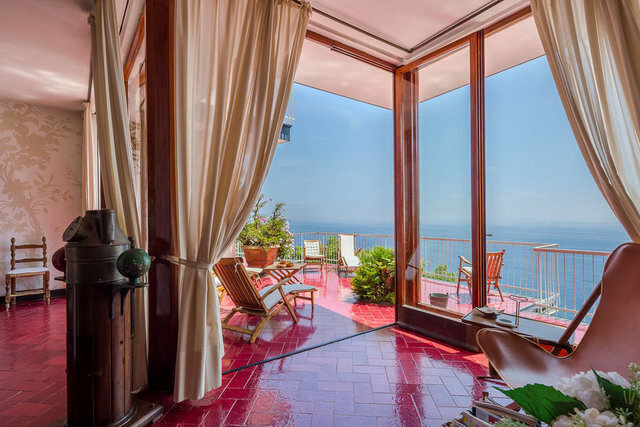 Designer villa in the exclusive pine grove of Arenzano, coveted project of the '60s conceived by the most renowned Italian architects, such as Caccia Dominioni, Gardella, Magistretti, Zanuso and Giò Ponti, directly overlooking the Ligurian Sea from Capo Noli to Punta Chiappa. The villa has been carefully designed by Ignazio Gardella, who has been able to enhance the magnificent location with truly unique panoramas: each room overlooks the sea, and even the slit above the fireplace has been designed to enhance the view over the landscape. The garden that surrounds the property comprises a gorgeous infinity pool, lawns, pine trees, olive trees and Mediterranean shrubland. A characteristic feature of the villa is the bunker, built by the Germans in World War II - precisely because of its unparalleled dominant position - that forms the central structure of the property, perfectly integrated with the new part and the surrounding landscape. Overall, the villa is of 550 sqm, with 8 bedrooms and 7 bathrooms, and the garden is of about 2,500 sqm. The pine grove of Arenzano is the closest tourist spot to the sea for those who come from Milan, Switzerland and Germany, easily accessible via a highway that enables to avoid the queues during the weekends. The property offers the possibility to easily practice any kind of sport activities, including golf, and all this in an oasis of greenery, with 24/7 surveillance system.